The Gate River Run is my favorite run of the year. A 15k, its 9.3 miles is long enough to be challenging but still doable. I’ve managed to participate in the Gate River Run for 10 years straight which I think is pretty impressive. 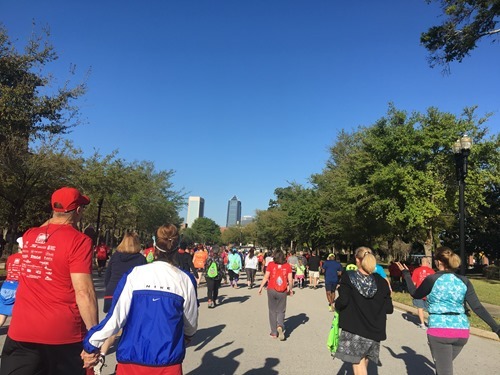 Unfortunately this year I was fighting another injury (Plantar Fasciitis) that would keep me from participating in the 15k. I was really disappointed but had to keep the streak alive. As a result, I registered and walked the 5k this year. It was interesting to see the race day from a different perspective. Since my friend, Elena, has moved to China, I had to drive to this race on my own. That too was odd. Running races has always been a very social experience for me. I love running into friends at the races and meeting up for beers afterward. This year I did manage to sneak in a meetup with my fitness friend, Anna, at the portolets! I also ran into my Tropical Smoothie Cafe friends Margo and Nick which was a nice surprise! 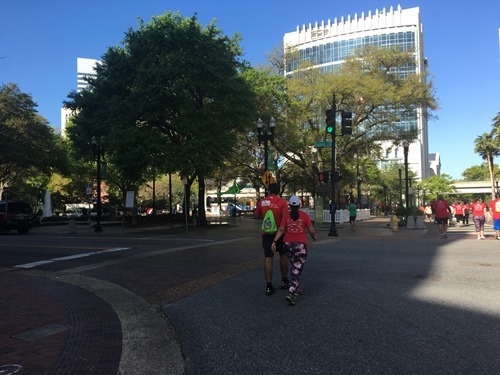 Tropical Smoothie Cafe is a sponsor of the 1st Place Sports Running Grand Prix Race Series so they were there to participate in the 5k run as well! Just like the 15k, everyone lined up at the start eager to get going. We started at the fairgrounds and headed West towards downtown. There were many walkers in the 5k so I thankfully didn’t feel too alone here. 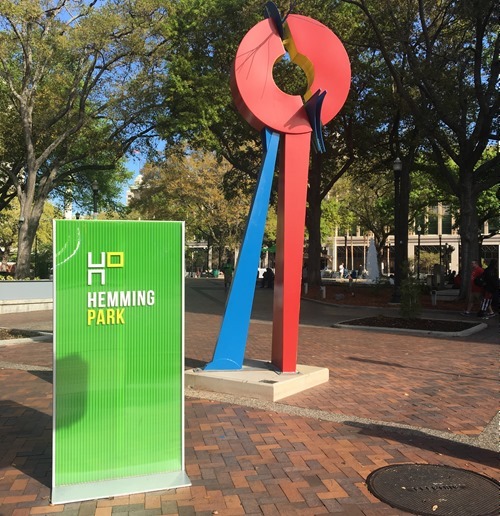 We walked just passed Hemming Park. It was an interesting course because I’d never run this route before. I’m used to running 5k downtown that starts from the Landing with a similar course, so this was a nice change. Walked passed Sweet Petes and Candy Apple Cafe! Makes me think of their delicious bacon! This whole race was a struggle and not that much fun. My foot was cramping and really bothering me. I just couldn’t stretch it out. Frustrating to think I was struggling just to walk 3 miles. But I got my medal and kept the streak alive, so at least there’s that. Afterwards, I headed to the Cora Rehab tent inside the Personal Running Solutions tent for free ASTYM from Kasey. I should warn you. If she’s over-caffeinated, avoid at all costs! haha, This was the most needed yet most painful ASTYM I’ve ever had. She was an ASTYM machine that morning and very popular with all the runners. I was so glad she was there! Afterward, I snuck over to the Gate VIP area. Thankful I managed to get a wristband this year. It’s great because they have chairs, beer, food and ice cream! Posted in race recapBookmark the permalink.